Fibromyalgia is a condition that has a set of consistent symptoms but, unlike a disease, there is no proven cause. The attempt to describe fibromyalgia is usually reduced to a recitation of the most common symptoms. Pain, generalized stiffness, sleep which is non-restorative, fatigue, depression, lack of concentration, and digestive upsets are the most common complaints, among a host of others. Fibromyalgia is difficult to diagnose as the usual kinds of laboratory tests do not reveal abnormalities. Some speculate that as many as 10,000 people are affected in North America, while other numbers vary from 2% to 3% of the population. These estimates are unreliable as many are undiagnosed and it is therefore difficult to find exact numbers. Many suggest it has become an epidemic. 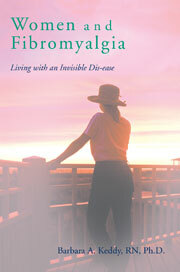 Fibromyalgia is said to affect primarily women. The reason for this is unknown. I have developed a theory about why this is so common in women , or more to the point why more women than men disclose their condition to health professionals than do men. However, with the amount of research that is being reported about Post Traumatic Stress Disorder it appears likely that men suffer as much from this mysterious condition as women, but up until now has not been reported as frequently. Fibromyalgia is a personal, social and political concern. I discuss these issues in my book. The blogs on this web site differ from the content of the book and are generally initiated by my everyday insights and experiences as the journey through life with fibromyalgia continues. The combination of both the blogs and the book together provide an in-depth understanding of this invisible dis-ease.